The state of finances for American banks is dire. Last week I noted the latest on the legal right of title problem associated with sub prime that could result in enormous loan losses for US banks. More this week as the details unfold. 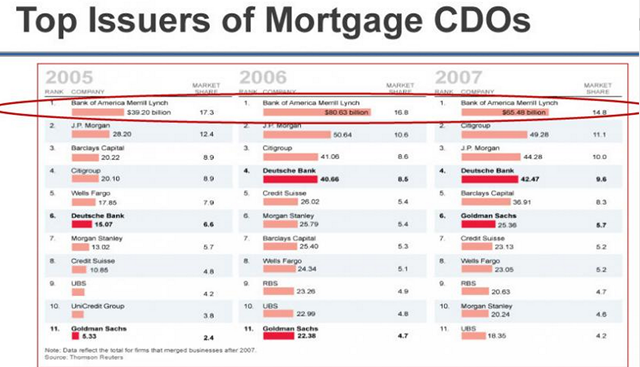 Branch Capital as reported by John Mauldin calculate $74 Bn in losses for Bank of America alone. The more striking names here though are the European banks which were also amongst the hardest hit back in 2009/9, ie, RBS, Credit Suisse Deutsche Bank and UBS. The bottom line is that the banks who purchased subprime mortgage paper from US banks have the right to ‘put back’ to the original issuing bank. This will be a long drawn out legal affair as potentially each mortgage is pulled apart in front of a judge and a determination made. What makes it worse is that each mortgage was often referenced in more than one piece of mortgage paper. Lawyer work is a growing business for financial services in America.